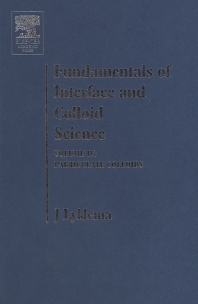 Volume IV (2005) covers preparation, characterization of colloids, stability and interaction between pairs of particles, and in concentrated systems, their rheology and dynamics. This volume contains two chapters written, or co-authored by J. Lyklema and edited contributions by A.P.Philipse, H.P. van Leeuwen, M. Minor, A. Vrij, R.Tuinier and T. van Vliet. The volume is logically followed by Vol V, but is equally valuable as a stand alone reference. Physical Chemists working in Colloid, Interface, and Surface science; Industrial/Applied scientists in pigment, emulsion, dispersion, and powder research; Pharmaceutical Chemists in membranes and drug formation. Intro to volumes IV and V, definitions, history. 2) Preparation and characterization (A. Philipse). Methods of synthesis, precipitation reactions, nucleation and growth, size control and dispersity, characterization, recipes. 3) Pair interactions (H. Lyklema). Gibbs energies of interaction and disjoining pressures under various conditions and geometries. DLVO and DLVOE. Hetero-interaction, external fields, magnetic colloids, non-aqueous systems, experimental techniques, case studies. 4) Dynamics and kinetics (H. van Leeuwen, M. Minor). Diffusion, Brownian motion, coagulation kinetics, electrodynamics of pair inteaction, relaxation phenomena. 5) Concentrated colloids (A. Vrij, R. Tuinier). Osmotic equilibria, structure factors and correlation functions, hard sphere and soft sphere models, phase stability and phase transitions. 6) Rheology (T. van Vliet, H. Lyklema). Flow and deformation, descrptive and structure-based rheology, dynamics, yield stress, experimental techniques, viscosity of colloids and polymers, gels. (ii) Appendices (A. Philipse, H. Lyklema). Size distributions, interaction formulas, Hamaker constants. (iii) Cumulative subject index volumes I through (V. Hans Lyklema).